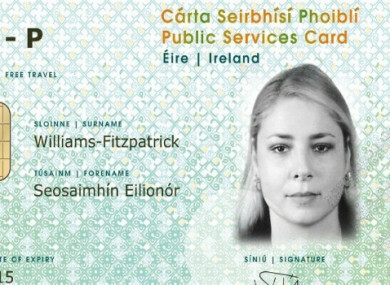 STAFF WHO’VE FOUGHT to try to stay on at the Department of Social Protection after six years of working on the rollout of the Public Services Card are likely to have their contracts “phased out” next year. The controversial card was first introduced in 2012 for accessing certain social welfare payments, but has since been expanded as a requirement for many other services. It also has a seven-year lifespan. It has proven a source of controversy after the government announced plans to make the card a requirement to access other services such as getting a driving licence – but has since rolled back in a number of areas. Over 2.9 million people have been furnished with a card, and it’s cost the government roughly €60 million so far. Up to 200 temporary clerical workers were hired by the department to administer the cards in 2012 and, despite unions managing to secure contracts for a number of them in recent times, the department has contested this at numerous hearings of the Workplace Relations Commission. Their contracts stated their job is to “facilitate the implementation” and “begin the roll out” of the Public Services Card. Once that has been completed, their contracts will be terminated. Workers have argued that the so-called end date has been constantly shifted and moved. And, as the government has pressed ahead with the card, and has already begun to look into the “second generation” of it, the workers argued they should be made permanent because working on the PSC had become part and parcel of everyday work. Furthermore, they argued that work on the PSC had become so intensive that permanent clerical workers were involved in working on it regularly, while their own roles had begun to involve other clerical matters. The clerical officers took their employers in the Department of Social Protection to the Workplace Relations Commission (WRC), seeking to have their fixed-term contracts changed to permanent ones. Across a number of different cases before the WRC the staff were bidding to be transferred to permanent contracts. One WRC adjudicator noted in the most recent case involving five of the workers: “It was advanced that PSC work had become part and parcel of everyday work for the respondent’s staff and consequently did not meet a transient need. It was further asserted that the objective grounds no longer existed and have not existed for some time. It was argued that the respondent’s target dates were a moveable feast, that this was unfair and constituted a breach of the legislation. The worker’s union said it could accept the need for fixed-term staff, but where someone had been in employment for longer than four years the department should provide very specific reasons why their contracts shouldn’t be converted into permanent ones. The WRC, however, sided with the department and noted their defence that none of the people involved had been offered two or more successive fixed-term contracts, so the possibility of renewing these had never arisen. The department told the WRC that when the need for these workers to help with the roll out of the PSC ends, each of the clerical workers will have their contract terminated. A spokesperson for the Department of Social Protection told TheJournal.ie that the staff were originally hired for the specific purpose of facilitating the implementation of the PSC programme. “Once the implementation phase of the public services card programme is complete, the purpose for which the Temporary Clerical Officers were employed will cease, and therefore the need for temporary staff will also cease,” the department said. It is expected that these contracts will be phased out during the course of 2019. The management of PSCs will then become part of the department’s ongoing operations and will be staffed from within the department’s existing permanent cadre as part of the department’s Intreo network. However, despite this most recent case before the WRC turning out unfavourably for the workers, there was an almost identical case last year where one clerical worker had the WRC rule in their favour. In that June 2017 hearing, the staff member said that given the work they were doing had no real end date and was contingent on when the “implementation” of the PSC was finished, they were entitled to a permanent contract. Furthermore, they submitted that the clerical work they did often overlapped with that of regular, permanent staff. The adjudicator in this case said: “I am satisfied that the contract – a fixed purpose as opposed to fixed term – was silent on the event that would determine the contract. It is unfair to allow a fixed purpose contract to be determined on an arbitrary date that is chosen by an employer after rights to a CID (contract of indefinite duration) have already been accrued. It is precisely this; holding an employee on a string of uncertainty, that the Protection of Employees (Fixed-Term Work) 2003 Act seeks to avoid. In that case, the WRC recommended that the worker be given a permanent contract. As of March this year, union Fórsa said that it had initiated 30 separate cases to try to secure permanent contracts for the temporary and had been successful in many of them. It said the department had agreed to give permanent contracts to a number of staff members after union involvement. Given the most recent case where five workers were unsuccessful, it is clear a number of the original 200 still face being “phased out” in 2019. Email “PSC staff losing battle to stay on as department confirms contracts to be 'phased out' in 2019”. Feedback on “PSC staff losing battle to stay on as department confirms contracts to be 'phased out' in 2019”.